It’s no secret that a business’ online reputation is of chief importance to the modern-day consumer. Whether we are talking about finding a quality electrician in Cincinnati or shopping online for tech gadget gifts for holiday gifts, you want to make sure that the provider you choose is reliable and trustworthy. Luckily, we have numerous review platforms where we can find this kind of information. Urbanspoon, Yelp, Google, Facebook, HomeAdvisor — they all help folks find reviews that help us make sure we get the most bang for our buck. But from a business’ perspective, it can be difficult to adapt to the newfound world of online reviews. No matter the service or product offered, there are times when things don’t go to plan and/or customers are seemingly impossible to satisfy. You can’t really control the 1-star review they leave, even if you have done everything in your power to provide exceptional customer service. While that is certainly a challenge of the online-review system, we’d like to take the opportunity in today’s post to highlight what sets us apart as Cincinnati electricians. 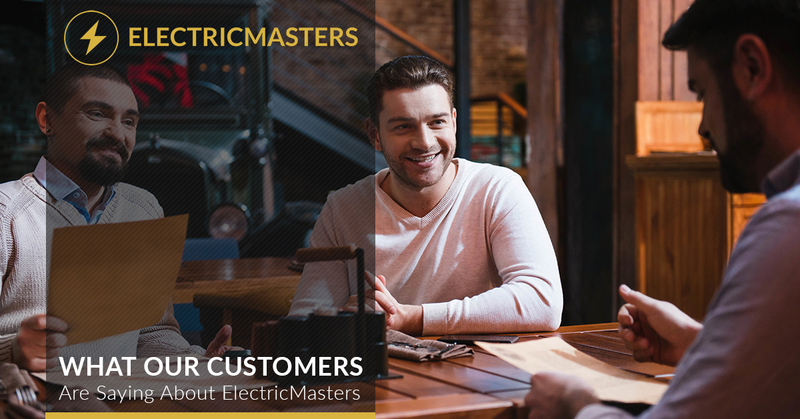 We fully understand that most people are more likely to post reviews when things haven’t gone according to their expectations, and that is exactly why we wanted to highlight a few testimonials where people were so thrilled with the service they received from ElectricMasters that they felt compelled to tell the world about it! So we hope you enjoy reading reviews from folks who were once in the same shoes as you; looking for a high-quality electrician or HVAC company they can count on in Northern Kentucky and Cincinnati! John, we can’t tell you how much we appreciate you taking the time to let us (and others!) know how your experience working with us at ElectricMasters went. We are thrilled that we were affordably able to solve your problem while also giving you some tips about what will help you save some money in the future! Paige, you are absolutely right — Jack is wonderful! Your experience is not an uncommon one, we must tell you, as we consistently hear great reports about Jack’s level of customer service. Don’t hesitate to reach out to us again for any and all of your HVAC and/or electrician-related needs! Sharon, we do hope you think of us again in the future! We wanted to highlight Sharon’s review because she speaks to our efforts to always have a dialogue going with our customers. Some projects might take an hour, and others a number of days. Regardless, we want you to be informed about every step of the project or repair being performed. Thanks for your business and kind words, Sharon! The final review we’d like to highlight in today’s post is Dustin’s. Dustin pointed out that we are efficient, affordable, and experts in our industry! Thank you Dustin, for letting us know how we are doing. Please think of us again in the future! At the end of the day, you want to find an electrician you can count on. At ElectricMasters, we blend quality with value to make sure you are set up for success. Schedule your appointment with us today!